Hedgehogs and ferrets are pets in households of all types. They're cute and exotic, and most enjoy interaction with humans, particularly if they have proper accommodations and you've socialized them. In general, ferrets and hedgehogs have similar requirements, although ferrets require a little bit more as far as accessories and housing. Ferrets and hedgehogs both require habitats that have quite a bit of space per animal compared with other domesticated rodents. Wire cages are ideal for both because they allow for ventilation and for interaction with the outside world. Hedgehogs fare well in a shallow, long aquarium, given it has a secure top to keep your critter in. As far as floor space, the absolute minimum for a hedgehog is 2 feet by 2 feet; for ferrets, the minimum is 36 inches by 18 inches. But the ferret's enclosure should have vertical space. A ferret needs a multistory habitat to exercise his body and his mind as he explores, climbs and plays when left in the cage alone. Both of these creatures need toys, exercise equipment and other accessories in their habitats. Both of these critters are omnivores, although ferrets eat a primarily carnivorous diet. For ferrets, a high-quality, high-protein, high-fat cat kibble or ferret food is ideal. Hedgehogs require a balanced hedgehog kibble or low-fat cat kibble. Each needs treats of cooked eggs, cooked chicken and vegetables. Ferrets don't process fiber too well, so avoid high-fiber vegetables as treats for them. Ferrets eat several small meals per day as they metabolize the food they eat quickly; hedgehogs thrive on one or two small feedings per day. Ferrets are known for weaseling out of their cages and into potentially dangerous situations. While hedgehogs aren't quite as agile as ferrets, they can still escape rather quickly. Ferret- and hedgehog-proofing entire rooms is a must, as slender ferrets get under appliances or into small access holes in a blink, and hedgehogs are small enough to get out of sight in the blink of an eye. While hedgehogs enjoy out-of-cage time, they're not quite as rambunctious as ferrets. Ferrets and hedgehogs enjoy the company of their humans, but ferrets tend to enjoy going for walks and similar activities. Both ferrets and hedgehogs love to play, so having a few toys in the cage is a great idea to prevent boredom. For a hedgehog, give him a few hard rubber balls or some cardboard and let him go to town. The prickly little guys also need an exercise wheel. For out-of-cage time, you can get a large exercise ball for your hedgehog and let him roll around to explore the surroundings. Ferrets enjoy many cat toys and small balls to roll around and pounce on. Ferrets are known for eating rubber and plastic, as well as chewing on cloth, so leave things made of these in your little guy's cage only when you're watching. Ferret like to explore and they oftentimes steal things from their humans, so toys are a must for in and out of the cage. 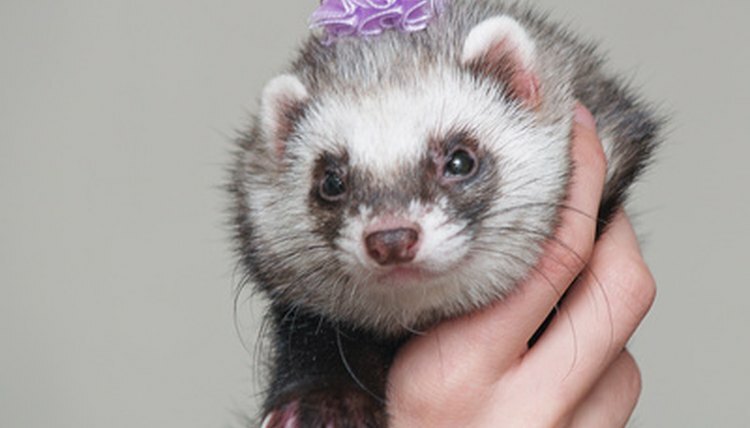 Ferrets love to snuggle, too, so provide soft blankets, pet beds and hammocks for their cage. HedgehogWorld.com: Hedgehogs: Are They Legal in Your State?